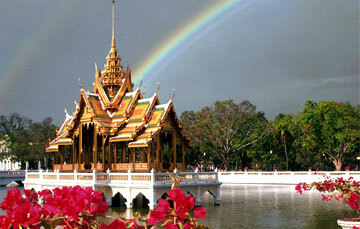 This glorious Kingdom of Thai is perfectly poised at the centre of Southeast Asia. Being at the middle, it truly affirms to be the heart of the region. If you look at the map of Thailand closely, you will realize its unique shape. It seems that the geographical boundary makes the head of an elephant: the head and ears outlining the landlocked regions, particularly the northern and eastern ones. Further, the trunk of the elephant seems to extend down the Malaysian peninsula. Land between the Andaman Sea and the Gulf of Thailand gives an exact image of the extended trunk. However, these are just illusions and interpretations which reveal the geographical setting of the country and the regions it share its border with. If we go into the details, Thailand shares its border with many countries: it boasts a mountainous border with Myanmar (Burma) which seems to provide it a shelter from the north and west, the Mekong River splits the country from Laos to the north and east; and both the Mekong River and the Dongrak Mountains outlines the border of Cambodia to the East. Covering an area of approximately 514,000 sq kms Thailand stands against Spain in terms of size which further makes it the 50th largest country in the world. This exotic country is positioned mere 15 degrees north of the equator. Being close to the north, Thailand has a tropical climate. However, the temperature ranges between 19 to 38 degrees C (66-100 F). The country rejoices monsoons from May to July and the cooler and drier weather falls around November and December. The four primary regions of this enchanting nation are geographically distinct and fall within the tropics, in spite of having geographical boundaries. The western border with Myanmar comprises some intriguing mountains that rise as much as 2,565 meters (8,415 ft). This mountainous region with high peaks is replete with fascinating species of wilds contributing to a magnificent range of wildlife to Thailand. However, the interiors are dominated by the Central Plains which takes pride in housing the Chao Phraya River that feeds the elegant rice fields making the country the “Rice Bowl of Asia”. In addition to these natural, geographical regions, the country is segregated into 76 political provinces. The territory is beautifully adorned with national parks, wildlife sanctuaries, and spectacular forests, waterfalls, and beaches apart from the man-made attractions.